Sorry for the recent blogging hiatus - life has been CRAY lately between finding a place in San Francisco and a big new job offer! But don't worry I'm back in the game now. And honestly there's nothing I'd rather talk about than my obsession with wide brimmed hats as summer approaches. I recently bought this gorgeous Tory Burch fedora after my post on a Tory Burch Friends + Fans Sale and I seriously couldn't be more obsessed with it. No but really, I want to wear it 24/7. Talk about a way to make a girl feel instantly chic and put together - throw a fedora on. No, not the creepy old man fedoras, don't worry. Aside from being SOCUTE, hats actually serve a purpose too people. Let's be honest, there's nothing more unattractive (or PAINFUL) than a super bright red, burnt scalp. Or face. Or anything... So, as my fam vacation to Mexico approaches (CAN'T WAIIIT) I thought I'd share some of my recent to-die-for hat finds so that you, too, can feel fabulous while protecting that pretty little head/face of yours this summer. That Tory Burch hat is gorgeous, a great purchase!! Congrats on the job offer! That's awesome. I love fedoras. They really are so perfect for summer. Congrats on the job offer and good luck on the house hunting! I'm lovin' that Tory Burch fedora... perfect for the weekends. 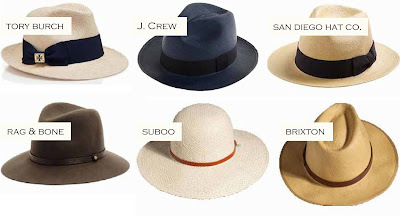 the rag and bone hat is my favorite! congratulations! I really like the San Diego Hat Company one is my favorite! I just got back from Mexico last weekend. It was so wonderful. I'm sure you'll enjoy your trip! love that tory burch one!